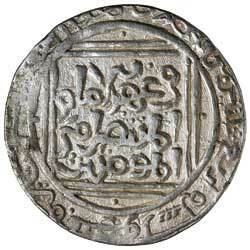 SULTANS OF BENGAL, Rukn al-din Firuz, struck in his name as Sultan of Delhi (A.H. 633, A.D. 1236), Silver tanka, Lakhnauti Mint (10.77 g), AH 634 (1236 A.D.), citing the caliph al-Mustansir, single dot in angles variety, (G&G B53 RR). Good very fine and extremely rare, the date unpublished for this type. Ex Dr V.J.A. Flynn Collection and Baldwin's Auction Sale 53, 25 September 2007, (lot 1630, purchased for �460). 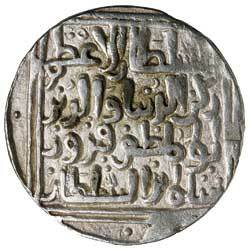 Struck in the name of Firuz by the governor 'Izz al-Din Tughral Tughan Khan at the mint of Laknauti.